Variety is the Spice of Music Therapy … and Life! Home/Care/Variety is the Spice of Music Therapy … and Life! Over the past 20 years, Masonic Village at Elizabethtown’s music therapy department has developed a wide variety of programs to provide quality — and variety — to the lives of our residents. 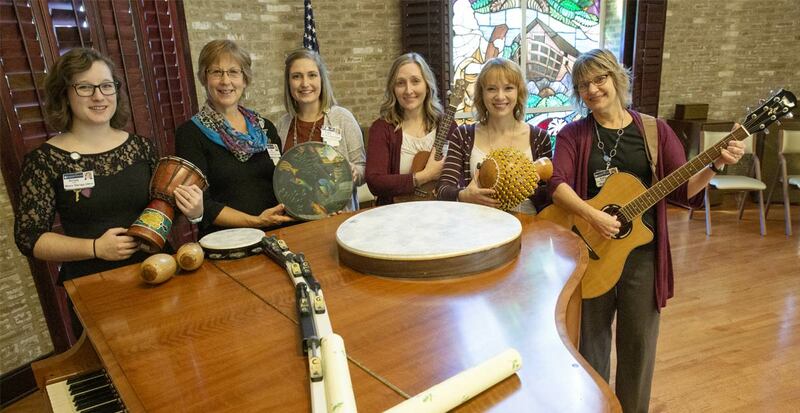 From ringing chimes to singing, drumming, reminiscing, dancing and relaxing, Masonic Village’s five board-certified music therapists encourage diverse therapeutic music opportunities. During group music therapy, the most frequently-offered program, residents engage in active music-making with small handheld instruments such as castanets or drums, moving to music with scarves or ribbon wands, and singing familiar and new songs. During Music and Memories, residents recall memories related to live or recorded music, often on a specific topic such as colors, weddings, school days or staying warm in the winter months. Jokes, short stories, poems, trivia questions and education are also part of these sessions. Four chime choirs, several multi-neighborhood vocal choirs and a ukulele choir give residents a chance to perform, providing music for worship services, singalongs and special programs. Our ringers play chimes with one music therapist as the director and another play a piano accompaniment. For our residents who used to sing in choirs, we offer resident choirs and the “Good News Choir,” as well as opportunities for holiday caroling. Music therapists are constantly assessing residents’ interests and needs and creating new groups. Recently, rhythm groups and drum circles have been added to neighborhood programming. Creative rhythms, following musical cues, and instrumental improvisation are all interventions used in these groups. If there is one thing our residents love more than music, it is music with kids! Our intergenerational programs incorporate active music making, moving to music and singing with children from our campus. Referral-based Music-Assisted Relaxation groups and a Music Therapy Bereavement Group were developed this past year to benefit residents with specific emotional or pain-related needs. Some of our residents do not benefit from or enjoy group programs but have a strong connection with music. These residents work with a music therapist individually. After an initial assessment, the pair meets to work on individual goals ranging from increasing positive emotional expression, decreasing perception of pain, increasing social interactions, maintaining gross motor movements, decreasing a negative behavior or increasing opportunities for reminiscing. Some interventions offered might be songwriting, improvisation, playing an instrument, singing, active music listening, music-related cognitive stimulation or music-assisted relaxation. Masonic Village music therapists continue to look forward to finding creative, musical solutions for our ever-changing resident needs and interests. About the author: Angela Ortiz (third from left, above), a graduate of Slippery Rock University, has worked for six years at Masonic Village at Elizabethtown as a music therapist/recreation therapist on the Washington 4 neighborhood.